BASIX is a planning initiative of the NSW Government that requires all new dwellings to to be designed and built to achieve a 40% reduction in water consumption and 40% reduction in greenhouse gas emissions compared to the average dwelling.That is, new dwellings have to use less water and be more energy efficient. A BASIX certificate has to be lodged with the Development Application plans. Typically the BASIX certificate for a single dwelling is a six page document, with a unique certificate number. A BASIX certificate for a large multi-unit residential development may be twenty four pages. 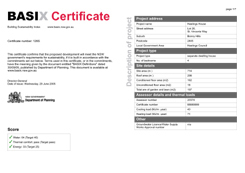 A typical BASIX certificate for a single dwelling includes commitments that certain items will be included in the construction. For example some commitments could be R2.5 ceiling insulation, a 3000 litre rain water tank and a solar hot water system. A building certifier will check that all BASIX commitments have been built or installed before issuing an occupancy certificate. Typical Documents for a new dwelling. and (3) a set of plans with a Thermal Specification attached on one nominated sheet. The Thermal Specification has same number as the ABSA certificate and is stamped and signed. What are the requirements to get a BASIX certificate? The BASIX certificate is produced by inputting information into the BASIX website run by the NSW Government. Rather than prescribing specific design features or technologies, BASIX is flexible, allowing many choices about how to meet the required water and energy reductions. a rainwater tank for garden water use and toilet flushing and/or laundry. design features that make the most of natural heating, cooling, and lighting. The score in Thermal comfort is a simple PASS or FAIL. A dwelling will get a pass if there is an adequate level of thermal performance for winter and summer appropriate to its climate. The Thermal Performance requirement can be achieved either by completing the information on the BASIX site or by having an energy assessment done by an accredited assessor and using the results on the BASIX web site. The time to do a BASIX assessement varies depending on the complexity of the design and the choices desired by a client. Please contact the office for a quote. We can do the complete BASIX certificate or provide you with the Thermal heating and cooling loads to place in the BASIX web tool. A BASIX certificate for alterations and additions does NOT require a separate Therml performance assessment. A well designed house means it is easier to comply with BASIX requirements and you save money in compliance and running costs. A well designed house will achieve excellent heating and cooling figures, making it easier to achieve 40 in Energy section of BASIX. Seeking our advice before the plans are finalized may save changing the plans or having to commit to more expensive BASIX commitments. Choosing energy efficient appliances, incl air conditioners.